For your convenience, all of the details of Direct Cremation can be done via fax, phone, and/or email. Click HERE to get started. We gothe extra mile for the the families of Houston Texas. 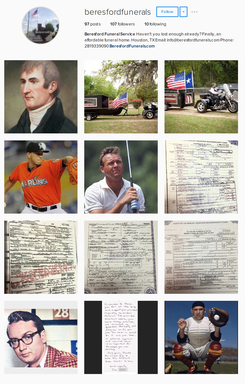 Beresford Funeral Service is a different kind of Houston funeral home. Chip Beresford, the founder of The Pine Box in Houston, founded Beresford Funeral Service on the same principle – funeral homes in Houston are too expensive and they do not need to be. With this principle in mind, Chip established The Pine Box to sell funeral service merchandise – the same merchandise sold by large expensive funeral homes – for less cost to the families of Houston. Now Chip Beresford has brought this same philosophy to funeral home services in Houston. In addition to saving on casket prices, urn prices, cemetery markers and more, you can now save on funeral home prices in Houston, Texas. 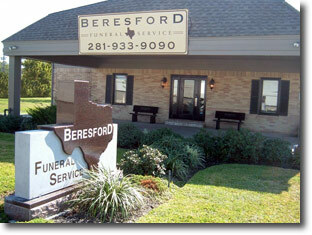 Beresford Funeral Home is a different kind of funeral home in Houston, Texas. We perform funeral services and/or visitations in our funeral home facilities, OR in your home or place of worship. You save money and many times family and friends are more comfortable in a familiar place. We have performed funeral services and burials at many churches and cemeteries throughout Houston, click here to see a sample listing of churches and cemeteries where we have performed services. So, whether you are in Baytown, Katy, The Woodlands, Galveston, Rosenberg or, Richmond, you can take advantage of Beresford Funeral Home's exceptional pricing and service. Contact us to see how we can help you in your time of need in planning for the future. Review this website to learn more about our funeral services and cremation services in Houston. Be sure to look at our Funeral Package Builder where you can select a popular funeral package or cremation package of services and save. Also, take a look at the benefits of pre-planning a funeral to save on time, cost and to reduce stress on your family when the time comes. Of course we are always available to answer any questions or to assist you in your time of need. Beresford Funeral Service in Houston is here for you.